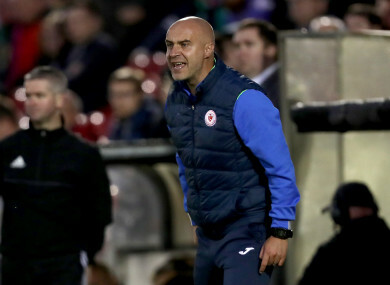 SLIGO ROVERS ENDED a run of four consecutive home defeats with a 0-0 draw against St. Patrick’s Athletic at The Showgrounds on Saturday evening. The hosts also managed to keep their first clean sheet of the season in a much-improved performance, although they will be frustrated that it wasn’t all three points in a game where they were the better side despite going a man down late on. Brazilian Eduardo Pinceli went close from distance with just four minutes on the clock. This before the game was delayed for five minutes as a result of an injury to referee John McLoughlin, who was then replaced by the fourth official Damien McGraith. In a scrappy first half, both sides dealt with what the other threw their way. James Doona’s shot from range was just inches off target, before the hosts really took control of the game thereafter. St Pat’s went in search of the opening goal, but almost ended up conceding the opener for their efforts. Under pressure from the visitors, Sligo did well to clear the danger with Calum Waters’ headed clearance falling into the path of the onrushing Raff Cretaro. The Sligo veteran spotted his team-mate Adam Morgan begging for the ball, and the Liverpudlian charged towards goal, before dragging his shot just wide of goalkeeper Barry Murphy’s post. Rovers certainly had the best of the early chances, with the unmarked Patrick McClean going close as he nodded Rhys McCabe’s corner just over the bar. Sligo controlled proceedings in the second-half, but were unable to really break down the Saints defence. The visitors, on the other hand, barely threatened Mitchell Beeney in goal, forced to try their luck from distance for most of the game. The home fans were on their feet when David Cawley’s outstanding cross from the right fell nicely for the diving Cretaro, the 36-year-old however could not connect. Adam Morgan was left kicking himself when he missed a sitter from three yards out with just minutes left on the clock. Cawley was handed a straight red card in the dying minutes after handbags involving a number of players, much to the disgust of the home fans. Sligo Rovers: Mitchell Beeney; Gary Boylan, John Mahon, Patrick McClean, Calum Waters; Jack Keaney, Rhys McCabe (Caolan McAleer, 45), David Cawley, Raffaele Cretaro (Ally Roy, 93), Eduardo Pinceli (Adam Wixted, 78); Adam Morgan. St. Patrick’s Athletic: Barry Murphy; Simon Madden, Kevin Toner, Lee Desmond, Ian Bermingham; Dean Clarke, Ryan Brennan, Darragh Markey (Conan Byrne, 46), Jamie Lennon, James Doona (Killian Brennan, 81); Christy Fagan (Jake Keegan, 54). Email “Sligo forced to settle for a point as former Saint Cawley is sent off against old club”. Feedback on “Sligo forced to settle for a point as former Saint Cawley is sent off against old club”.